Well it is New years Eve and 2011 is coming to an end. It has been an interesting year. I for one am ready for the New year. I say, bring it on. I have meet so many wonderful people through my Blogging Adventure. I look forward to seeing your new blogs, making and getting comments. It makes my rather hum drum life a little more fun and exciting. I hope we all continue in this New Year and more and more of us out there find each other. Sissy Dog and I want to wish you the Happiest New Year Ever and hope that only good and wonderful things come from 2012. Be careful, be safe and most of all, BE HAPPY!!!!! 4 foot antique goose feather tree adorned with antique hand blown glass ornaments in the library of My Old Historic House. Feather Christmas Trees were first created in Germany in the late 1800's. They are regarded as one of the first type of artificial Christmas Trees. These first trees were. in part, a response to growing environmental concern in the 19th century, concerning deforestation from harvest, of Christmas Trees in Germany. The tradition of feather Christmas Trees was brought to the United States by German immigrants.The specific location and creators in Germany are not known. They were a cottage industry along side ,the hand blown glass tree ornaments. Benefits touted to feather trees included the elimination of a trip to the tree lot, no shedding needles, and not having to replace it each year. These original feather trees are valued by collectors and sometimes bring a big price. Feather trees became popular during the late 19th century and early 20th century. These trees were sold at department store, mail order catalogs and country general stores, all over the United States. Feather trees were made of green dyed goose feathers. They were stripped of there hard center and wrapped around a wire. The wire wrapped with feathers ,were then attached to a wood pole, making them resemble a Christmas Tree. The branches were widely spaced to keep candles from starting a fire and to show off the ornaments. Feather trees ranged widely in size, from a small 2 inch tree to a 8 foot one. Some branches were tipped with a fake red berry or a metal candle holder. Both round and square bases were used as holders. These replicated the buckets that were used for the bases of the live evergreen trees in Germany. The trees came in various colors, white, green, blue and gold. The green, being the most popular. These trees were no longer produced after WW!. After the war, Americans started making there own versions of the artificial Christmas tree. All types of materials were used. In the late 1900's -Christmas reproduction feather trees, started showing up on American Markets. At this time ,American craftsmen were producing real feather trees as well as fake ones. Feather trees became very popular in America when President Roosevelt also responded to the supply of fresh evergreens in America. This is the hand stenciled base. These trees fold up, and can be stored very easily. Here it is after I shaped it up. You can see it holds a lot of ornaments and these are really big ones. They were first for sale in Sears Roebuck Catalog in the late 1800's and early 1900's. They were lite weight and folded to about the size of an umbrella, so they were easy to ship. During the first part of 20th century , Sears offered feather trees with electric lights, built in. In more recent years, feather trees have achieved a new level of status among Christmas collectors and decorators, both old heirloom and new construction. The new feather trees can be found in many stores and on the web today. They range in price from a few dollars to hundreds of dollars. If you would like to buy a new one, do your research and check prices before you buy. They prices can really vary from one seller to the next. Make sure and ask, if they are really feathers and not paper or plastic. If you care for them properly, they should last for ever. I love the way they show off your ornaments. If you are a big Christmas Ornament collector, a feather tree is a real must. I have several ,new reproduction, feather trees that I use and have for sale at my shop. I love to sell ornaments from them, as they display so well. I bought mine from The Bethany Lowe Company, and they are very reasonable. I have two real, old ones ,I use at home. One is 3 foot and the other is 4 foot. I have had them for years. I think, way back , I paid around $400.00 each. They can be decorated in a few minutes and will hold much bigger ornaments than you think. I love to load them down, with bigger ornaments toward the trunk and medium to small one on each limb. I think they just look wonderful , in any style or age of a house. I sure hope you are getting everything ready for Christmas at your house.If you don't have a feather tree, maybe it will be something you will consider in the next years to come. Watch out for after Christmas sales and you might find one at 1/2 price. I am ready for Christmas , and waiting at, My Old Historic House. Please come by for a tour anytime. I will leave the lights on and Sissy Dog will always meet you with a jump and a kiss. Sissy Dog helping to decorate the antique feather tree. Put one here, Daddy. Why would you look at that tree when you can look at me? 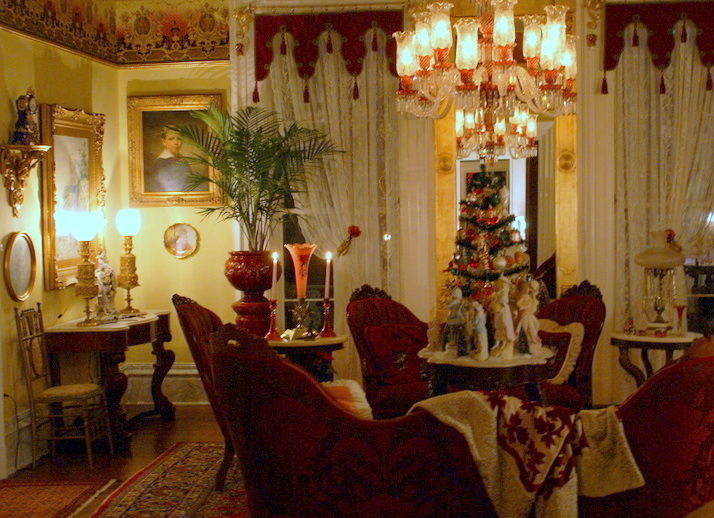 The library at My Old Historic House with the 1899 feather tree decorated with antique ornaments. I have a collection of hand blown glass ornaments I use on this tree. Most of them are reflectors, and have a pushed-in side, making them reflect the lights from the room. I bought this one when I was 14 at the dime store, I think it was twenty five cents. THESE FEATHER TREES ARE IN MY SHOP, RICHARD'S GREAT STUFF. This is a 4 foot white tree, I have for sale and use for display, in my shop. Richard's Great Stuff, in Clarksville,Mo. A reproduction 3 foot, two tone green feather tree in my shop. A 2 foot dark green feather tree with red berry tips. This is in my shop, it is for sale and I use it for display. This is an antique small feather tree that I have for sale in my shop. 17 inches tall. So cute. A four foot pink feather tree. This one is often used for Easter as well. Great for a little girls room. The Up River or Ladies Parlor at My Old Historic House with an antique feather tree on the center table. Sissy was worn out from all that decorating , she could't wait to get to bed.